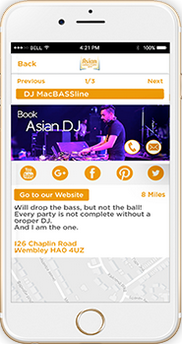 - the Asian Directory App! Are you a student looking for the next hot bhangra club night? Need to find an Asian-focused business, product, or service quickly and easily? Maybe you need help planning your dream Asian wedding? Then you need the Asian Directory App! DOWNLOAD OUR FREE-TO-USE APP FROM THE APPLE STORE, WINDOWS APP STORE, OR GOOGLE PLAY STORE TODAY. IT’S TOTALLY SECURE AND WE WILL ALWAYS RESPECT YOUR PRIVACY. Connect with a multitude of Asian-orientated businesses in your local area, easily and quickly, and all at the click of a button. Preview their ratings and feedback in just a few swipes, then click to call, email, or visit their website or social media. Finding the business or product you need has never been easier. Take us wherever you go -to find your dream wedding location, locate that perfect restaurant to eat out, or find the ideal outfit. We have every type of business listed, from solicitors to travel agents, make-up artists to wedding planners.